This is not at all an Irish recipe, as the title would suggest, but a very Italian one! Cooking other ingredients like you will do for risotto is quite common, even for pasta. Of course you always have to adjust the timing. 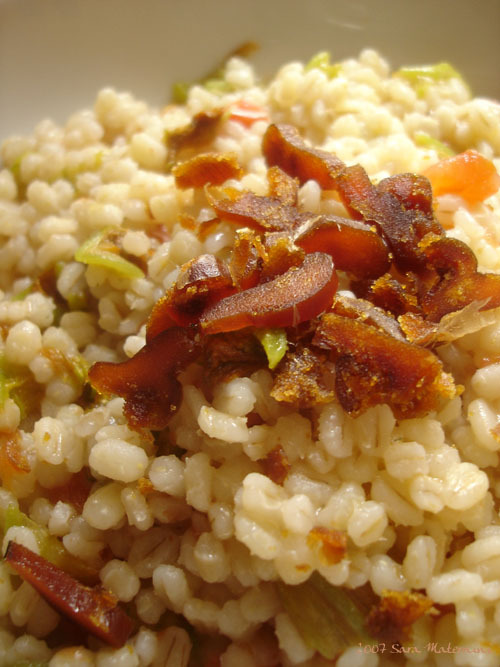 Barley is very good cooked with the absorption method, especially in the pressure cooker: you will obtain an orzotto all’onda (a barley[ris]otto waving in your plate!). For every 100 g of barley, use 400 ml of water or stock and cook it for 25 minutes. The method is very simple: you wash your barley under fresh water, hot some oil in the pressure cooker, add the washed barley (and the other ingredients, if this is the case), then cover with water or stock, close the lid and cook.